Using social media platforms in a newsroom can be a love/hate relationship for many of us. It seems we are constantly debating what to share, how much to share and when to share. I’ve always been a “social media supporter” in newsrooms. Always encouraging and pushing the stations I have worked for to share more and do more on the platforms, including Facebook. Why? For me the answer is easy and has a lot to do with how I see my role as a journalist: I’m a public servant, here to provide the information they want and need to make decisions in their lives. So, if people are choosing to consume that information on social platforms, like Facebook, I need to be there sharing information. Since March, I’ve been working as a trainer for the Society of Professional Journalists and the Facebook Journalism Project. So far, the free training program has taught new tools and best practices to more than 1,400 journalists. Go LIVE. According to Facebook, LIVE videos receive 10 times the number of “likes” compared to non-live videos posted on the the social platform. If this isn’t enough to make you consider going LIVE think about why people like LIVE video: the excitement, the immediacy, the authenticity. As journalists we are given access to so many places, events and people. Let’s capture those moments and share them with our communities. Yes, you could just record a video but why not increase the excitement and bring the user to the scene with you in real time? If you haven’t tried LIVE video and are afraid of how it may turn out, try going LIVE to just yourself. Yes, you can do that. Just select “only me” in the share settings. Create for the Digital User. This is probably the No. 1 mistake I see news organizations do (it’s something I’m guilty of too.) We try to reuse content made for TV, radio, print or other social networks and think it will be successful on Facebook. While I understand it saves time and makes sharing content often more realistic, it really is best to share directly to each social platform and create content with the digital user in mind whenever possible. This means thinking about things like how users scroll through their feeds with the sound off, so adding text and using graphics will be helpful and enticing to users. Also, consider adding music and breaking away from the typical TV PKG format. Respond to Users. 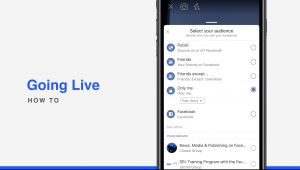 Building community and hosting conversations is something Facebook strives for and one of the ways journalists can do that is by engaging with our users. This means both when there are positive and negative comments. Think about what’s realistic for your newsroom. Can you respond to every comment? Maybe 75 percent of the comments? When you respond you start to create dialogue and let your users get to know your news organization and your journalists better. Not only can responding build community though, it can help you improve as a news organization. Ask for feedback on stories. Listen to your community. There may be elements, voices or communities you didn’t include in a story that are important. Most importantly, remember, it’s social media. Share, explore and have fun! Lynn Walsh is an Emmy award-winning freelance journalist who has worked in investigative, data and TV journalism at the national level as well as locally in California, Ohio, Texas and Florida. She produces content focused on government accountability, public access to information and freedom of expression issues. She’s a trainer for the SPJ and Facebook Journalism Project and is also helping to rebuild trust between newsrooms and the public through the Trusting News project.